The inside of my pop-up card -- the hard part (LOL). From the scored position, come in 1 inch from the RIGHT and cut (with blade) 1/2 in above the scored line and 1/2 inch below. From the scored position, come in 1 inch from the LEFT and cut (with blade) 1/2 in above the scored line and 1/2 inch below. Bend/pop out the box you just created and fold. 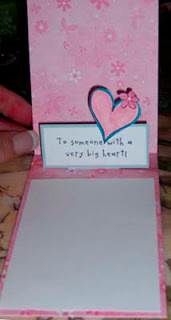 When ready, adhere/cover the inside of the card with DSP from Flowers for You (light pink/floral piece). Score the same as the real card/outside card but may have to trim a little -- test folding to see. Trim if necessary. Choose desired greeting - I used the Happy Heart Day stamp set. Cut pieces of paper to fit greeting/layered. Adhere to pop-up piece/front. Stamp the heart from Time Well Spent stamp set, color, and adhere to greeting. Also, I adhered a white piece of cardstock to the inside to write you own message.